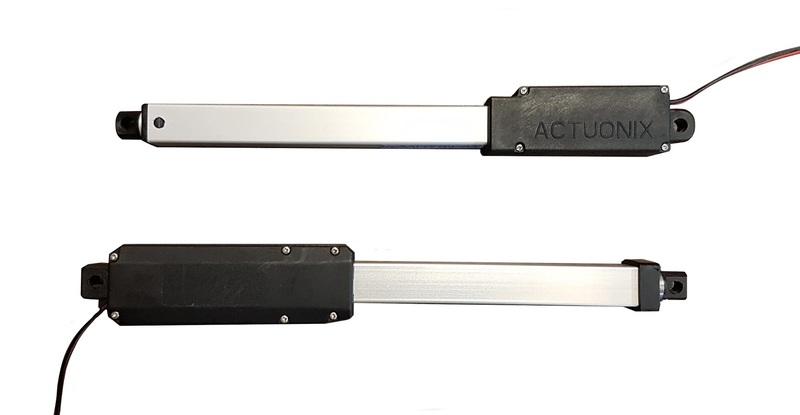 Actuonix has been manufacturing micro linear actuators since 2004. When we say 'manufacturing', we mean that we design our products in-house. Our team of engineers designs every one of our actuators from scratch, right here in Canada. Before Actuonix (formerly Firgelli Technologies) started making micro linear actuators, there was nothing of the kind on the market. There were small actuators, but nothing in our price range and many of them were difficult to use, requiring complicated control systems. 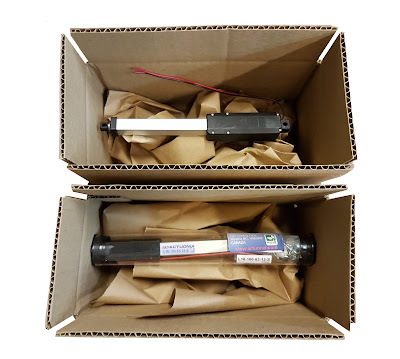 In recent years we have seen products that look very similar to our L16 line of micro linear actuators appearing in various web stores as well as on EBay and Amazon. This is not a coincidence. Though slightly different in appearance, these products were designed to be a copy of our popular L16 models. On top is our L16 micro linear actuator, the device below is the knockoff model available from a few different outfits online. 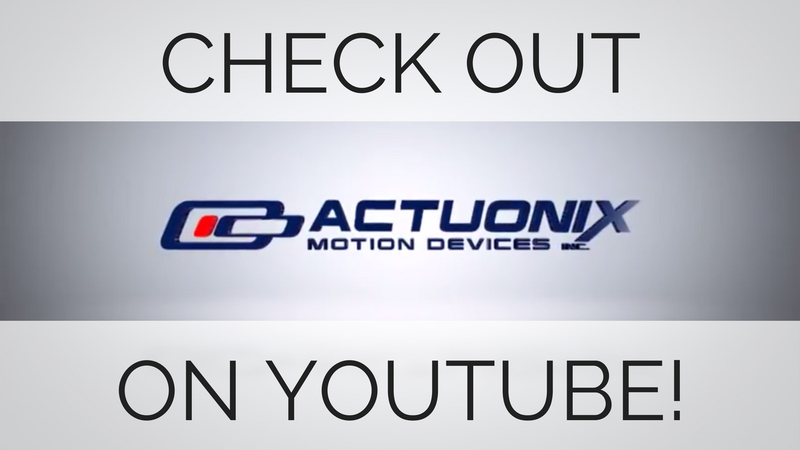 Today, I want to talk frankly about our products, as well as these other actuators, and show you why we think that Actuonix is the superior choice. Our actuators are an original product, designed by our in-house team of engineers in Canada. These other actuators are actually a copy of our original design. Several years ago, our L16 actuator was given to a Chinese factory by a competitor so that they can produce a copy of our product. These actuators are the end result of that effort. Online retailers that claim to ‘manufacture’ these units are misleading their customers. They did not design nor manufacture their actuators, they simply order the units from a factory listed on Alibaba and apply their company sticker. That’s why there are so many different outfits selling these identical copies of our product, whereas the original Actuonix actuators have our name molded into the plastic housing, and are only sold under our name. The failure rate on our actuators is extremely low thanks to our thorough testing department. Every single unit is tested at our Canadian facility by our expert staff before it ships. If a unit does not pass quality, it doesn’t ship, simple as that. This is how we are able to keep our failure rate to the customer so low. Other retailers are just that, retailers. As such they have no facility or personnel to test every actuator. They rely on the quality control capability of the factory in China, and we all know how reliable that can be. We stand behind our products, it is rare for our customers to have issues, but if they do, we do everything we can to ensure that they remain a happy customer. Even if they’re outside the warranty period, we try to work with our customers to try and resolve the situation to their satisfaction. I want to talk for a minute about buying in bulk. We sell thousands of our micro linear actuators to OEM manufacturers all over the world. Other than the quality and diversity of our products, a main reason that they continue to buy from us is that we offer the lowest bulk pricing for both stock units and custom linear actuators. Because we manufacture our own products, we control the supply chain completely. This allows us to negotiate volume pricing on many individual components when we order large quantities. We love passing those savings down to customers who purchase our actuators in bulk. Some other retailers may try to act as a middle man between you and the factory in China, which leaves you vulnerable to their ability to communicate. We also have the manufacturing muscle to get your large order built in a reasonable length of time. We have manufacturers who order from us by the thousands of units, and they are consistently impressed by our lead times. That’s another benefit of being completely in control of the manufacturing process. Actuonix has more micro actuator models than anybody. At the time of this article, we have 164 unique models. These models come in strokes of 10mm, 20mm, 30mm, 50mm, 100mm, 140mm, 200mm and 300mm and a wide variety of gearing options plus a variety of accessories such as switches, remote controls, power supplies and control boards. Our team is always developing new products. We are in fact about to release a completely new line of actuators in the coming weeks so keep an eye out for that. All of our in-stock orders are shipped every day at 2pm. That means if you place an order at 1:30pm PST, it will leave our facility that day. We offer UPS as a shipping service. We only offer UPS because as a high-volume customer, we are able to negotiate the best rates through them. We pass our great shipping rates on to the customer. You only pay what we pay for shipping; Actuonix does not use shipping as a means to generate revenue. We can ship on your account as well using UPS, FedEX or DHL. All orders come with a tracking number. All of our actuators come packaged in a protective tube, wrapped in paper and in a box padded with more packing material. Some of these competitor's devices come just sitting in a box with some paper. Your shipment is not well-protected this way. Our actuators range in price from $65-90USD. The pricing on our actuators varies depending on model and control type. These knockoff micro linear actuators cost between $64.99 and $69.99. We don't play the .99 game. We know our customers are aware that $69.99 is one cent less than $70. The pricing looks similar on the surface but a key thing to remember is that when you buy from Actuonix, a hardware kit comes included with your actuator and contains everything you need to mount the actuator to your project. This kit is customized for the unit you purchase and includes a threaded end-tip that you can use for custom mounting. You also get a connector on the wire harness which the other actuators do not have. Of course if you do not need it, you can always just cut it off. Actuonix is always looking for new ways to give back to the engineering community. Just this year we have launched an engineering scholarship program as well as a FIRST Robotics Challenge team sponsorship program. We have service staff in-store from 7:30am to 3:30pm PST Monday through Friday excluding provincial and national holidays. We try to answer every call. If we're busy and can't answer your call, we are usually able to return your call same-day. The same is true for email; our typical response time during business hours is less than half an hour. We know that the value and service Actuonix offers with every sale is second to none. We want to thank all of our loyal customers who have helped us become the most trusted name in the micro motion business. We look forward to working with you for years to come. Your actuators must be good, they are in the space station! Great product. They must be excellent as they are used on the Space Station! Thanks Duncan, we sure think so!